The aim of this research is to examine professional personality competence of physical education teachers working in secondary and high schools in Çanakkale with gender, school type, school level, years of service and sport branches. The research was conducted according to the scanning model. The research group is formed by physical education teachers (n=92) who works in the public and private schools connected to the Ministry of National Education in Çanakkale Center, Ayvacık, Bayramiç, Biga, Çan, Ezine, Gelibolu, Gökçeada, Lapseki and Yenice towns in 2013-2014 academic year. The mean age of the study group is 38,7. While 35,9% of the study group is formed by female physical education teachers, 64,1% of the study group (n=59) is formed by male physical education teachers. PET Professional Personality Competence Scale which is developed by Büyüknacar (2008) as data collection tool and redesigned adapted to the physical education teachers by Demir (2012) was used. According to the obtained research results; subcomponents of professional personality competence of physical education teachers, gender, years of service, type of school, school level and sport branches are evaluated as “completely adequate”. However, it is seen in all variables that the mean scores of respect for human dignity and justice subcomponent were found to be lower than the other subcomponents. According to the results, physical education teachers see their professional personality component “completely adequate”. But, in respect for human dignity and justice subcomponent, it is thought that having the lowest average score can cause problems. Aracı, H. (2001). The physical education in schools for teacher and students. Ankara: Nobel. Atencio, M., Jess, M. and Dewar, K. (2012). It is a case of changing your thought processes, the way you actually teach: implementing a complex professional learning agenda in Scottish physical education. Physical Education and Sport Pedagogy 17 (2), 127-144. Bilici, M. (2005). School administrators the ideal is that physical education teachers to investigate and evaluate their expectations. Master’ thesis. Sakarya: Sakarya University. Biscan, D.V. and Hoffman, S.J. (1976). Movement analysis as a generic ability of physical education teachers and students. Research Quarterly. 47, 161–163. Büyüknacar, C. (2008). The study of the relationship between emotional competence and professional personality traits of anatolian and science high school teachers on the basis of students' perceptions (A case study in Gaziantep). Master’ thesis. Gaziantep: Gaziantep University. Centra, J.A., and Potteer, D.A. (1980). Schol and teacher effect: An international model, Review of education research. 50 (2), 273-291. Chen W., Mason, S., Staniszewski, C., Upton, A. and Valley, M. (2012). Assesing the quality of teacher teaching practise. Educational Assessment, Evaluation and Accountabilty 24, 25-41. Çamlıca, C. (2008). Student studying in secondary school physical education classes about the thoughts and expectations (Ankara sample). Master’ thesis. Konya: Selçuk University. Darling-Hammond, L. (1999). Teacher quality and student achievement: A review of state policy evidence. Washington: Stanford University. Demir, E. (2012). Working in secondary school physical education teachers’ professional personality of competence perceptions of assessment. PhD thesis. Istanbul: Marmara University. Demir, E. (2013). Working in secondary school physical education teachers’ professional personality of competence perceptions of assessment. V. International Congress of Educational Research 6-9 June (1826-1840), Çanakkale; Çanakkale Onsekiz Mart University. Eken, D. (2008). Secondary students’ thought and expectations about physical education classes. Master’ thesis, Konya: Selçuk University. Eroğlu, B. (2011). Of teaching practice effects candidates of the physical education teachers’ professional compotence and professional attitudes towards. PhD thesis. Ankara: Gazi University. Genç, N. (2008). Physical education teacher’ perceptions of assessment practises and competencies. Master’ thesis. Mersin: Mersin University. General Directorate of Teacher Training (2012). Physical education teachers competencies specific areas. Available online at: otmg.meb.gov.tr/YetGenel.html (Accessed 12 April 2012). Güneş, A. (2003). Teaching physical education and games in schools. Ankara: Pegem A broadcasting. Güllü, M. (2007). Secondary school students’ attitudes toward physical education classes to investigate. PhD thesis. Ankara: Gazi University. Hacısalihoğlu, M. (2006). Physical education teachers’ of the course performance was evaluated by the students. Master’ thesis. Ankara: Gazi University. Ilkım, M. (2006). Physical education teachers’ according to working conditions to evaluate how they make course to physical education classes. Master thesis. Malatya: Inonu University. İnce, M.L. and Hünük, D. (2008). Competence of experienced physical education teachers in the reformn process and factors affecting them. 10. International Sports Science Congress (126- 129), Bolu: Abant İzzet Baysal University. ICHPER. SD, (2005). 46th. International Councıl for Healt, Physıcal Educatıon, Recreation, Sport and Dance World Congress Proceeding, Physıcal educatıon teacher standards. İstanbul: Marmara University. Available online at:www.ichpersd.org (accessed 10 September 2012). Kaya, K. (2010). Physical education teachers’ perceptions of professional competence. Master ‘thesis, Ankara: Gazi University. Kougioumtzis, K., Patriksson, G. and Strahlman, O. (2011). Physical education teachers’ professionalization: A review of occupational power and professional control. European Physical Education Review. 17 (1), 111-129. Lee, V.E., Robinson, S.R and Sebastian, J. (2007). The quality of instruction in urban high schools comparing mathematics and science to english and social studies in Chicago. Available online at: http://search.ebscohost.com.onelog.marmara.edu.tr:2048/login.aspx? (accessed 12 September 2012). McNeil, J.D. (1985). Cirriculum, a comprehensive introduction. Boston: Little Brown and Company. Mirzeoğlu, D., Özcan, G. and Çelebi, M. (2008). In the course of the teaching practise physical education teachers’ time management, analysis of professional and personal achievements. 10. İnternational Sports Science Congress (124-126), Bolu: Abant İzzet Baysal University. Monk, D.H. (1994). Subject matter preparetion of secondary mathematics and science teachers and student achivement. Economics of Education Rewview. 13 (2), 125-145. Öksuzoğlu, P. (2009). Physical education teachers’ perceptions of competence for the teaching profession. Master’ thesis. Mersin: Mersin University. Pill, S. (2004). Quality learning in physical education. Active & Healthy Magazine. 11(3), 13-14. Saçlı, F., Bulca, Y., Demirhan, G. and Kangalgil, M., (2009). Physical education teachers’ personal qualities. Journal of Sports Sciences. 20 (4), 145-151. Stronge, J. H. (2007). Qualities of effective teachers. USA: Alexandria, VA ASCD. Şahin, E. (1997). In the central district of Bursa in preschool education institutions to determine the Professional competence of teachers. Master’ thesis. Ankara: Gazi University. Şişko, M. and Demirhan, G. (2002). Elementary and high schools for boys and girls studying attitudes toward in the physical education and sport course. Journal of Hacettepe University Faculty of Education. 23, 205-210. Tannehil, D and Zekrajsek, D. (1993). Student attitudes toward physical education: a multicultural study. Journal of Teaching Physical Education. 13, 78- 84. TED (Turkish Education Association), (2009). Teacher competences. Ankara: Adım Okan Printing. Ünlü, H. (2008). Physical education teachers’ competencies and classroom management behaviors. PhD thesis. Ankara: Gazi University. Ünlü, H., Sünbül, M.A. and Aydos, L. (2008). Physical education teachers’ competence and the validty–reliability study. Journal of Ahi Evren University Faculty of Education. 9 (2), 23-33. Wilson, M.S. (2011). How can we improve teacher quality? Phi Delta Kapan, 93, (2) 61-64. Yaylacı, F. (2012). Quality development problem in physical education course. Bilim ve Aklın Aydınlıgında Egitim, 13 (147), 23-28. ISNAD Demir, Erdal . "Assessment of Professional Personality Competence of Physical Education Teachers Working in Çanakkale". 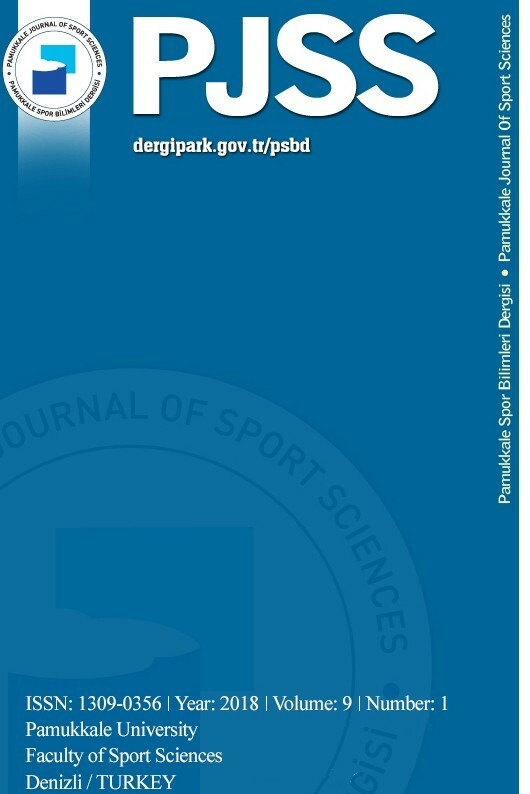 Pamukkale Journal of Sport Sciences 6 / 2 (May 2015): 17-32.